I got both my 16 speed pillar drill and my 8 inch bench grinder the same way. They didn't work and were heading to the bin. The drill press also had a broken casting where the work table clamps to the mast but that will be repaired for a different blog. The drill press was old and unloved and the company had bought a new one. The cost to get the bench grinder repaired professionally was 95% of its replacement cost. Love our throw-away society. Both had the same electrical problem. Flick the switch and..... a hum a wobble but they spin up to full whack when spun by hand. They both needed the Capacitor changed. The price of a new cap is maybe 10% of a new motor so even if the motor is knackered still, its worth trying the cap. Most bench grinders are of similar construction. All the electrics are in the base with the switch. 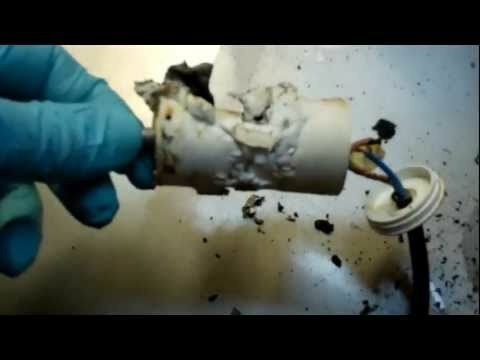 Be sure its unplugged, mains voltages can kill. Lay it on its back. With the base off it may look a little like this. The white cylinder is the capacitor. It may be grey black or blue but they are all cylindrical. With luck it will still be legible. A lot of the time it will have burst with the top or bottom expanded out the end. If you've been ignoring it for a while it may be burned to a crisp. The grinder had the rating quite clearly on the side so i replaced it with like but the drill had been used for years with the cap out so it was crispy. Capacitors must be correctly Sized for the motor. Also the may be cap start/run or just cap start. Grinders are always cap start/run and the caps must be rated correctly for that duty. My drill is cap start only. I determined this buy powering up the motor, spinning the chuck by hand to start is and then turning off the power. There was an audible "click" from the motor, that's the centrifugal switch operating. This means that you motor switches in and out the cap as required. no click may mean the switch is knackered but most likely is Cap start/run. 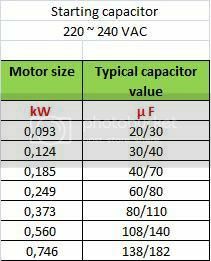 As i had no rating to guide me i used the following table to find the appropriate size for the motor. Don't fret if you cant get the exact replacement rating, as close as possible is ok. The cap on a pillar drill is usually in a housing on the side of the drill. Again, mine was missing but here's an example from my smaller press. Once you've installed the new cap, put it all together and fire it up. Be careful though.remember not to spin the chuck anymore!!!!! He started his woodworking business with NO capital, a few shop tools, and a lot of nerve, in a small 10x20 foot space and grew it into a 1,400 space in the first few months while still remaining as a one-person business! I've been told by Jim that there's only *8* slots left for the free bonus and one-on-one coaching. Once he fill up these last 8 spots, I can assure you it will not be repeated. P.S. P.S: My favorite section of the guide is where Jim gives you 10 of his TOP- SELLING wood crafts. This is really the "golden-goose" for woodworking businesses. I have a pillar drill, an Ajax, similar to your TruTool, bought secondhand and without an on-off switch. I have contacted Lathes.co.uk and have been offered an industrial switch for about £100, yet pillar drill switches are on ebay for £4-£5 or so. Do you think these switches are only for Mickey Mouse drills and I should go for the expensive one? Love this article. It definitely provides a TON of information about Pillar drill and Bench Grinder.Thanks for sharing your experience and for this helpful information.